At a star-studded red-carpet event in New York City, world-renowned Swiss watch brand Breitling celebrated the launch of its new Navitimer 8 collection and exhibited 60 vintage watches for the first time ever in North America. More than 300 distinguished guests from Australia, Latin America, Canada, and the United States were welcomed by Breitling’s new global CEO, Georges Kern, who introduced his vision for this storied brand’s latest chapter in a beautiful setting against the backdrop of the iconic New York City skyline. Houston Astros World Series pitchers Justin Verlander, Dallas Keuchel and Lance McCullers Jr., motocross champion Ken Roczen, former NFL quarterback and CBS NFL commentator Boomer Esiason, former astronauts Mark and Scott Kelly, and American actors Darren Criss, Olivia Munn and Armie Hammer were also in attendance for the festivities. 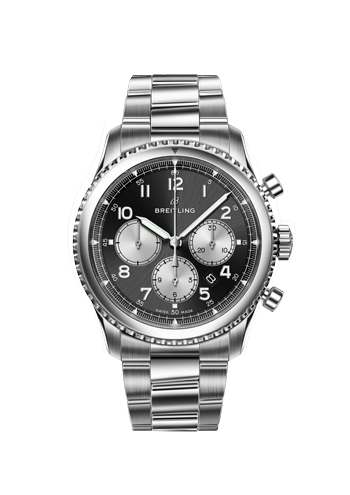 Breitling, which has a strong link to aviation, launched the Navitimer 8, a new pilot’s watch collection. The 8 in it’s name is a nod to the Huit Aviation Department, which was set up in 1938 to produce cockpit instruments as well as classic pilot’s watches for civilian and military use. At the time, Willy Breitling chose the name “Huit,” the French word for “eight,” as a reference to the eight-day power reserve offered by its storied cockpit instruments. He added that he was particularly excited about the newest product line.